Welcome to the Robert E. Hemenway Writing Center at the University of Kentucky. We offer free and friendly help to all UK students, faculty, and staff. We assist with the process of composing and communicating in writing, speaking, and multimedia projects across the curriculum. Graduate student consultants and undergraduate consultants provide individual and group consultations in Face-to-Face and e-Tutoring Consultations on academic assignments and professional projects. We help students at every stage of the composing and communicating process. In Writing Center consultations, we help clients—students, faculty, and staff—review their writing from the reader's perspective. We help clients fulfill assignment and project requirements, write for a specific audience, and learn academic standards of edited written English. 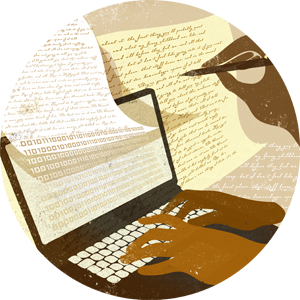 Although we help clients learn editing and proofreading strategies, we do not merely direct writers to "fix" grammatical errors—and we do not copyedit the work. Finally, we show clients how to locate and use online and print resources to help them follow models of formatting and documentation style, but we do not do the work for our clients. We offer Face-to-Face Consultations in the Writing Center and e-Tutoring Consultations online. To schedule a face-to-face appointment using the online schedule, click on a white (blank) space (an open appointment) that fits your schedule. When the appointment window opens, enter the required information and SAVE the appointment. You will receive a confirmation email/text and a reminder email/text. If no appointments are available, you can join the Waiting List. Click on the clock icon next to a specific date/day and enter the required information to join the waiting list. If an appointment becomes available, you will be notified by email and/or text message. When you receive the email/text, you must log on and try to schedule the appointment. Please note that others on the waiting list are, like you, trying to schedule the open appointment. Whoever schedules first gets the appointment. To schedule an e-Tutoring appointment, click on a white (blank) space. When the appointment window opens, enter the required information and SAVE the appointment. Then upload a document (a Word document of 1-10 pages) to the appointment form. 2.) When you are on the scheduling page, look in the top left corner of the screen under your name for a yellow file folder icon. Click on the file folder icon. 3.) In the window that pops up, select your e-tutoring appointment. Make sure that you select the correct appointment (by date, time, and consultant name). 4.) Next, upload your file to the appointment by using the "Choose file" button. 5.) Enter the File Name in the “Name your file” area. 7.) On the screen, you should immediately see a confirmation that you have successfully uploaded the document. You can also double-check the upload by refreshing your browser and opening the scheduled appointment; your uploaded document should now appear on the appointment form. At the appointment time, the consultant will review the document, add comments, and upload the review to the appointment form. In the review, we will provide questions and comments. We will NOT revise or edit your work for you, but we will show you how to revise and edit your work. When the review has been uploaded, you will receive a notification (email/text). IMPORTANT! If you are unable to keep an appointment (face-to-face or e-tutoring), please cancel online at least thirty minutes before the start time of the scheduled appointment. When clients fail to show up for face-to-face appointments by ten minutes after the scheduled start time, we mark the appointments as missed and cancel the appointments. If you MISS your appointment, it is marked as a NO-SHOW. If you MISS two appointments, your account is disabled for the rest of the semester. For an e-tutoring appointment, if you do not upload a document (and do not cancel the appointment at east thirty minutes ahead), we mark the appointment as MISSED. Contact Judith G. Prats, the Writing Center Director, at judithgprats@uky.edu to discuss questions about this policy.